Sometimes, you just see the title for a movie, and you’re immediately sold. You don’t have to see any trailers, read any reviews, or even know who else other than whoever’s received top-billing is starring in the film; as soon as you see that the movie is called The Man Who Killed Hitler And Then The Bigfoot, the first thing that comes into your mind is, “where is it showing and how soon can I get a ticket?”. But can a movie with a title as inspiring as that live up to such impossible hype? For the most part, yes; it certainly delivers on its titular promise(s), but it is also a much quieter and surprisingly strong character piece that puts it in a special league above the types of B-movies that this film is clearly paying homage to, which might put some people off if they’re going in expecting some sort of grindhouse action epic, but for cult film audiences seeking something a little chewier than they’re paying to see then they’ll find plenty to gnaw on here. At the beginning of the film, we meet our hero Calvin Barr (Sam Elliott), an elderly man who lives a quiet life in a small American town during sometime in the 70s or 80s (the exact year is never entirely specified). However, Calvin is no ordinary man, as we learn via flashbacks to him as a younger man (Aidan Turner) during the Second World War, that he carried out an extremely covert mission to assassinate Adolf Hitler, which was subsequently covered up by the Nazis. Filled with regret over all the things he’s done in the past, and the people he’s had to cast aside in the process including his girlfriend Maxine (Caitlin FitzGerald), he is understandably reluctant when he is approached by the US government for a new mission: the legendary creature known as Bigfoot not only exists, but is carrying a disease which, if spread to the human population, could be potentially fatal. Calvin’s mission is clear: hunt down and kill Bigfoot before it’s too late – but does he still have it in him, and more importantly can he bring himself to finally do the deed? You might be thinking that the answer is rather straightforward, and in some respects it is; the film promises a story about the man who – in the alternate universe it takes place in – killed Adolf Hitler and is now expected to do the same with Bigfoot, and without getting too much into spoilers it definitely delivers on at least part of that promise. However, the movie’s ultimate focus is not on what the man does, but rather on who the man is; a lot of it is spent just following this guy leading his unexceptional suburban life, going out with his dog, interacting with some of the townsfolk, occasionally meeting up with his younger brother (Larry Miller), and having a drink or two at the local bar. It might sound boring, especially for a film with a title as glorious as The Man Who Killed Hitler And Then The Bigfoot – and no, I will never get tired of typing out that full title – but it’s made extra compelling by Sam Elliott, who gives the character a true and honest sense of mystery that you’re keen on figuring out, even in scenes where all he’s doing is either sitting back in his armchair in front of his television set or trying to return a winning lottery ticket that he found in the park; all the time, you’re curious about who this guy is and why he lives the life that he leads despite a backstory that’s incredibly interesting, and Elliott is so good here at retaining the enigma about his character that you absolutely want to spend time with him and his mundane lifestyle just to get to know him better. On a side note, given that it is someone like Sam Elliott in the lead role, it leads my overactive imagination to decide that this film is just one of the many interesting stories that his narrator character from The Big Lebowski is telling us; or better yet, this could be a secret spin-off of his Oscar-nominated turn in A Star Is Born, where we get to learn more about his backstory before he became the manager of his younger brother Jackson Maine, before retreating to a small town following that movie’s tragic ending and settling in to a quieter but sad lifestyle. My imagination works in mysterious ways, and so does this movie for allowing me to come up with such a ridiculous head-cannon. But that is part of the overall charm of this movie; sure, it delivers on every single thing it promises in its title, but it takes its sweet time in developing this lead character as a person with an interesting backstory who we enjoy spending time with, and when the pace does eventually pick up when the hunt for Bigfoot begins it delightfully relishes in its B-movie origins while also having a surprisingly strong emotional weight to it. That being said, I can see this dividing a lot of people who see that title and go in expecting something completely off the rails, but come out somewhat disappointed that it wasn’t as completely action-packed as they were led to believe. After all, you see a title like The Man Who Killed Hitler And Then The Bigfoot and immediately think you’re getting a film that belongs in the golden era of exploitation movies, so it’s understandable if there is an air of disappointment around you afterwards. Personally, though, I did rather love this movie, even beyond its amazing title; it’s a well-made, surprisingly studious, and refreshingly quiet take on a legend that I now really wish truly existed. 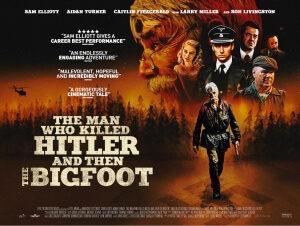 The Man Who Killed Hitler And Then The Bigfoot is, once you get over the excitement caused by that awe-inspiring title, a well-made and surprisingly studious B-movie that both delivers on its titular promise(s) and also gives an emotional character study that’s made even greater by Sam Elliott’s grand lead performance. It’s definitely worth tracking down.